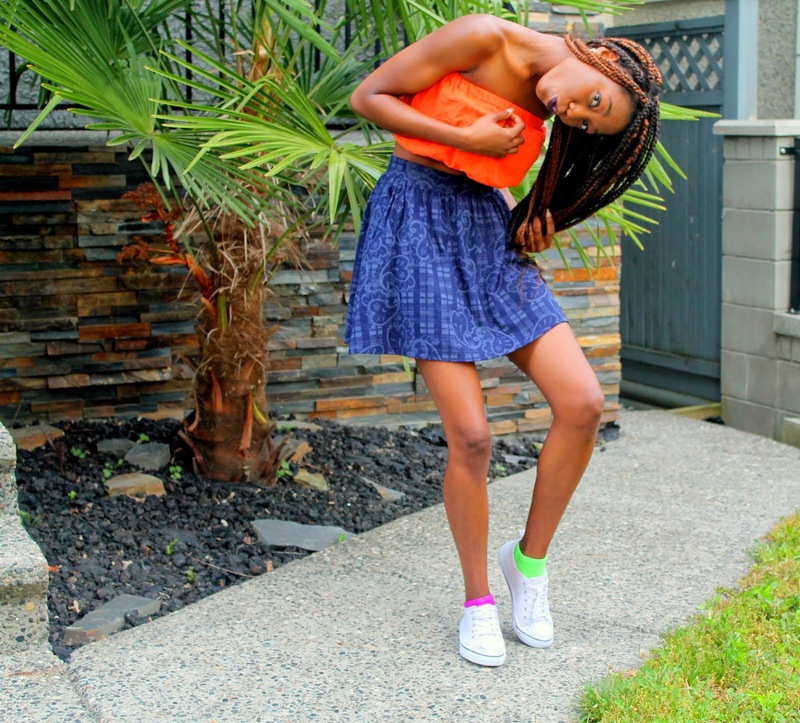 Looking for colors to rock this summer? Yes! Don’t be afraid to rock these, you never know until you put these BRILLIANT colors on . Hmmm you can tell I also tried wearing a dark lipstick, I find that it works too. There are ongoing outdoor events this summer, you want comfort all the way. I encourage you to try throw in some colors here and there. 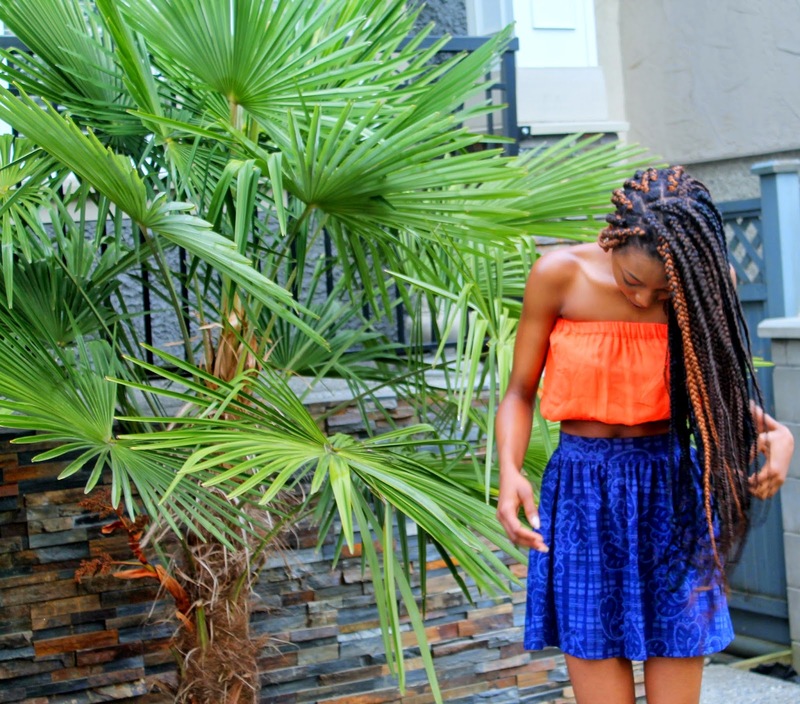 First off, I love it when color blocking loooooks good. 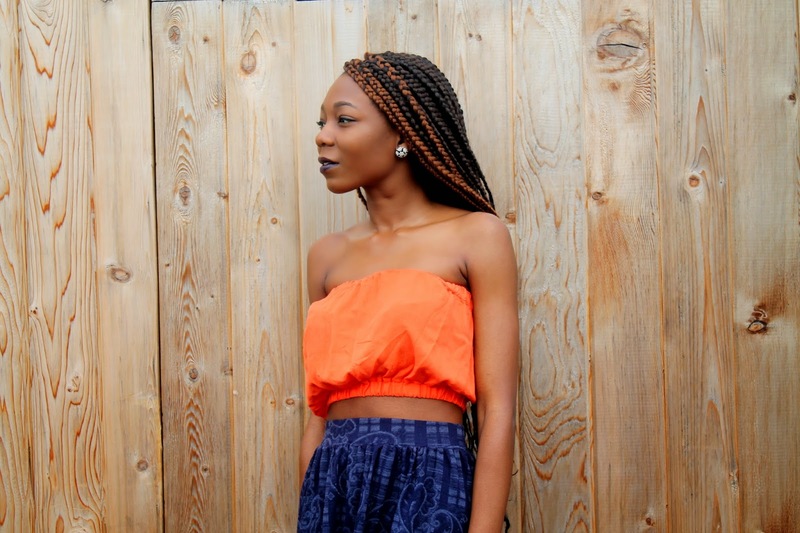 I’ve never really owned a bright colored orange clothing item, but this one crop top wants to stay. I paired this with this blue patterned high waisted skirt and a white pair of sneakers. I also played around with wearing two different bright colored pair of socks,hmmmn why not? . And Yes hair got changed, and I’m loving it, lots of freedom come with box braids. I hear the braid club say “Yeea” Lol, trust me it is freeing . It’s definitely a protective hairstyle if you ever sought out for one. Here we go! I’m wearing tangerine crop and navy blue skater skirt, if you look below it worked, even though i didn’t pair it asis on the chart, totally different, but works peerf! Okay, on been Missing In Action ( a.k.a M.I.A)? Hey girl! Nice to see you posting again– you look absolutely amazing here! Colour blocking has got to be one of my fav trends; as I am obsessed with bright, vibrant colours and prints, your outfit is hugely appealing to me! Also loving your gorgeous hair! Keep on inspiring with your awesome style and advice! Yes you are absolutely right, and I would encourage everyone going for darker colors to pick that option. I spoke in general what these colors actually do. But thank you for that tip, for pointing that out as some people don't know there are UV protected selections. I knowww 🙁 Yes definitely, we should definitely . Take amazing travel photos, I shall be on your blog. Indie Indie! you're far too kind. Thank youuu! Nice tips, Lord knows I know nothing about this stuff. You look stunning, that last picture is soo cute. I'm going to have to steal that pose :). The skirt is beautiful! Really lovely pattern. 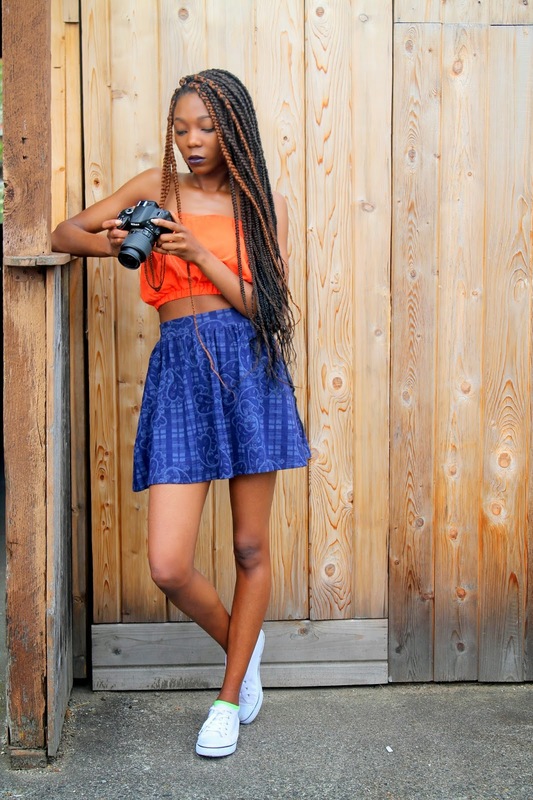 Colour blocking is something I want to do more of this Summer! Love this outfit too, very cute and casual. it's so good to read from you again. Thanks for sharing the tips…….and yes the competition is not with others but myself. You should definitely try it, thanks! 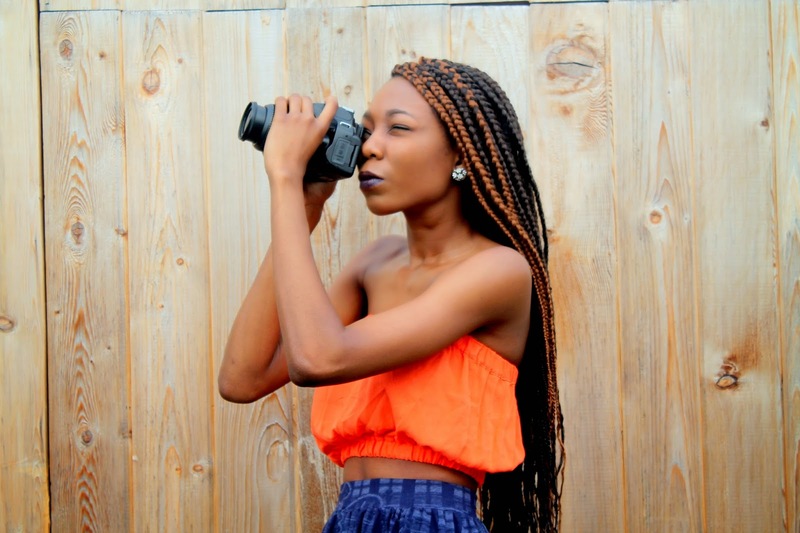 I love everything about this post, your braids are beautiful and the photos are perfect! X_X Awwe, Lol, thanks babe! Kum Kum! Thank you! You're always beautiful in photos and words.. I love the intro about colour-blocking. Now what I love is the neon and pink socks, menh I go to try that. This whole outfit is the bomb.